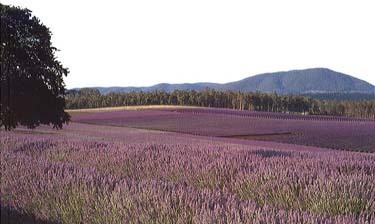 The Bridestowe Estate Lavender Farm is THE place to visit in Tasmania during December and January. This is the time when the beautiful flowers bloom. Don't be disappointed if you miss them-they may have been harvested, or you may be too early. But make the effort to come anyway, and you will be rewarded. Located in a postcard setting, with mountains rising up in the distance from fertile farming land and thick green forest. The Souvenier Shop is very special, being filled with a huge number of products using lavender, plus all the basic touristy essentials. Take a peak at the inside of the operation on a guided tour. -Excellent gift shop - do all your Christmas shopping here! -Toilets, Barbeques, friendly and helpful staff. -From George Town, take the George Town-Bridport Road, and turn off to link to the Lilydale Road at Pipers River. Then turn left and continue on until you meet the signs after Golconda. WARNING - Do NOT take the "Old Bridport Back Road" or the road that links the Tasman Highway to Nabowla. These roads are gravel and usually treacherous with large potholes and log trucks. For further information, ring the Bridestowe Estate Lavender Farm (Gillespies Road) on +61 (03) 63528182.